In Computing, we aim to give students the skills, knowledge and understanding to thrive in the digital world. What is it like to study Computing? AO1: Demonstrate knowledge and understanding of the key concepts and principles of computer science. AO2: Apply knowledge and understanding of key concepts and principles of computer science. AO3: Analyse problems in computational terms to make reasoned judgements; and to design, program, evaluate and refine solutions. This course is ideal for students wishing to pursue a career in the IT industry, use computing as part of their job or just with a desire to learn how to program effectively. The course is challenging but rewarding as it requires students to employ a high level of analytical and problem solving skills. You will need to be organised, motivated and prepared to think. Students with good maths, science, logical reasoning skills and a real interest in computers beyond just using them to surf the internet will excel in this course. Computer Science focuses on how computers work, rather than how and why to use them. The course will give learners a real, in-depth understanding of how computer technology functions from the basics of binary through to operating systems and onto hardware. It provides insight into what goes on ‘behind the scenes’, including high level language programming, which many learners find absorbing. A large part of this course will involve creating designs and coding software solutions using the Visual Studio programming environment, one of the best (if not the best) development environment available. Students will learn to program in Visual Basic, a relatively straight forward programming language for learning the principles of coding constructs, but also capable of developing industry strength applications. Through learning to program you will develop critical thinking, analysis and problem-solving skills as well as learning to think about efficiency and optimisation. The course will make an excellent preparation for learners who want to study or work in areas that rely on these skills, especially where they are applied to technical problems. These areas include engineering, financial and resource management, science and medicine. This course is a must if you are thinking of a career in one of the follow types of roles: Software Engineer, Programmer, Network Manager, Systems Analyst, Animator, Games Designer, Web Developer, Computer Technician Engineer etc. Digital Literacy – Understanding how to use technology effectively, efficiently and safely. How Computers Work – Understanding hardware and software components and technology. Computer Science Concepts – From data representation through to packet switched networking principles. Algorithmic Problem Solving Skills – techniques to break down large problems into manageable chunks. Programming – from design through coding to debugging and testing. - Introduction to Twynham IT Systems: Students learn about how to access and use the Twynham network, about key terms that will used throughout lessons and effective and efficient ways of working. Students learn introductory textual programming techniques by controlling an onscreen turtle to draw geometric shapes and patterns. - Binary Computers: The binary number system, storage capacities and file sizes. - Digital Literacy: Selecting Information - Searching skills, reliability, bias and copyright. - Beyond PowerPoint: Students learn how to structure and deliver effective presentations and gather feedback from peers via an online survey. Programming with Objects: Block programming techniques and constructs with Scratch. Computer Logic & Problem Solving: Logic gates and binary logic, algorithmic problem solving techniques, flowcharts, pseudo code and decomposition. Programming a Hardware Device: BBC Microbit coding using sensors and output arrays. Procedural Programming PtI: Using Small Basic to learn third generation textual programming constructs of sequence, selection and repetition through string handling and mathematical applications. HTML & Web Page Basics: How web pages get to the browser, are displayed and basic programming for layout definition. Bitmapped Graphics: Bitmap data representation concepts and editing techniques using Adobe Fireworks. Digital Mobile Technologies: Student learn how mobile phones work in terms of hardware and cellular networks. Procedural Programming PtII: Using Small Basic to develop event driven and graphical object programming skills. History and Future of Computing: Students learn about the origins of the electronic computer at Bletchley Park, artificial intelligence and robotics including societal implications. 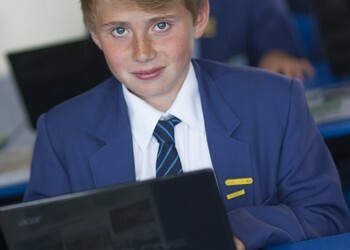 Computer Systems: Students learn about different types of computers including embedded systems, computer hardware components and types of software. Network Technologies & the Internet: Student discover the internet timeline, plot key inventions and discover how the internet works. Digital Colour: Students learn some fundamental Photoshop skills in order to get creative with their own photos. They learn about how digitally manipulated images have impacted on society and on young people’s perception of body image in particular. They also look at how copyright law works and how it has evolved in response to the information revolution. Online Banking: Student learn about online banking terms and security issues and use an online banking simulator to manage money.